This is the video for the OK GO song “Needing / Getting”. Besides making good music, OK GO is known for their special and intricate video clips. This clip is no exception featuring a car that plays all the instrument. This must have taken quite a while to set up. For more information and behind-the-scenes footage, see http://www.LetsDoThis.com and http://www.okgo.net. Railguns are something most of us know from science fiction, but they are quickly becoming science fact. The Office of Naval Research will start testing a prototype in the coming weeks. The principle is simple: it is a weapon that uses electricity rather than chemical propellants to launch projectiles. Magnetic fields created by high electrical currents accelerate an armature (which is sliding metal conductor) between two rails (hence the name) to launch projectiles at 4500 mph (7240 kph) to 5600 mph (10460 kph). The initial range is 50- to 100-nautical mile with planned expansion up to 220 nautical miles. This is just the first prototype to be tested. The next phases of the EM Railgun program include automatic projectile loading systems and thermal management to increase firing rates of the weapon. A vocal cover of the Simpsons intro by Nick McKaig. This guy does all the voices and music himself. The song is amazing, but the video itself is an excellent montage. Very nice to look at. 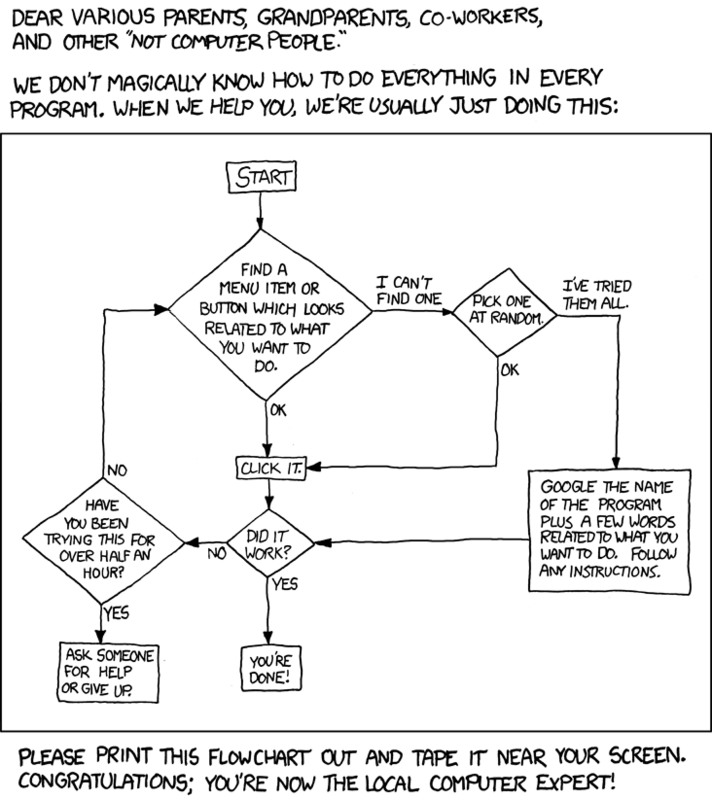 Don’t tell anyone, but this flowchart shows you how most computer technicians do their job. I looks simple, but a lot of experience is involved in correctly using this diagram. P.S. : Dynamix [dot] be does not take any responsibility for accidents or data loss when using this cheat sheet. The new video for Ghost by dEUS. A little blasphemous with Jesus being pictured as a skateboarder, gathering followers.